The handy annual reference, once considered by antebellum farmers to be so reliably true that upon it an oath could be sworn if a Bible were not available, is celebrating 200 years of continuous publication. 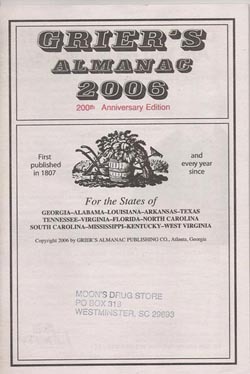 Named in honor of its founder Robert Grier, an uncle of Confederate States vice president Alexander Hamilton Stephens, the venerable old Southern almanac survived the Civil War and the Great Depression, and is read by over 3 million in thirteen states. An amateur astronomer, Robert Grier (1780-1848) originally made his astronomical calculations at his family's plantation in Talieferro County, Georgia. With a passion for astronomy, he became a wealthy man from the publication of his Georgia and South-Carolina Almanak. 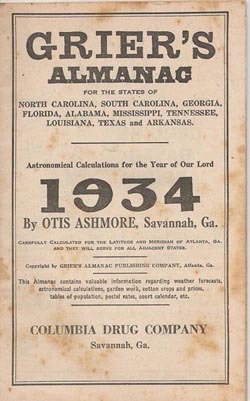 Upon Grier's death, a number of individuals kept the almanac going, eventually changing its name to Grier's Almanac. Today, Grier's is owned and managed by Bryan and Leslie Bachler of Atlanta. A film about Hank Williams' final three days, The Last Ride made waves along the film festival circuit this past summer. Thrilling diehard fans of the music icon, captivating the attention of film devotees and garnering awards and favorable reviews, the movie starring Henry Thomas and Jesse James with Fred Thompson and Kaley Cuoco, is slated for release in select theaters on October 21, and is expected to receive broader distribution in January 2012. The two principal characters, Hank (Henry Thomas of E.T. fame), known as Luke in the movie, and a young, newly-hired driver, Silas (Jesse James), embark on a road trip because inclement weather inhibits Hank from flying to a New Years' Eve concert in Charleston, West Virginia and a Canton, Ohio concert the following day. The Last Ride chronicles a sojourn's end for a successful but lonely and ailing singer who is about to become a legend and the beginning of a boy's journey into manhood as he broadens his horizons, finds liberation amid his own unpromising circumstances and discovers that loyalty really exists. One of them has alienated himself from friends and loved ones as his physical pain has worsened, and he gradually kills himself, popping pills and drinking his final hours away. The other has neither experienced a lucky break in life nor known love. Heck, he doesn't even own a radio, making him completely oblivious of his employer's real identity. At a critical juncture, the two eventually see that, in each other, they have found a true friend. 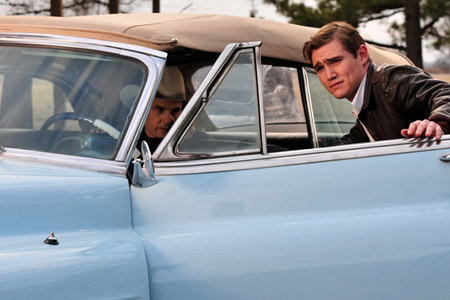 Jesse James plays Silas in The Last Ride. He began his acting career as a kid, and has had lead and supporting roles in a variety of movies, including As Good as it Gets, Message in a Bottle, The Butterfly Effect, The Flyboys, Pearl Harbor and Bones. He has also guest-starred on numerous television shows, including Fox's The X-Files, NBC's ER (1ooth episode) and CBS's Chicago Hope, Family Law, The Mentalist and Walker, Texas Ranger. GREG FREEMAN: In The Last Ride, you play the role of Silas, a kid from the wrong side of the tracks, who seems to be working on his degree from the School of Hard Knocks. And Silas is hired to drive a singer, who he knows only as Luke, to some concert dates. Tell us more about your character's background and how he winds up working for the legend in the making. JESSE JAMES: Silas' background is sort of revealed as the story of the film progresses. We learn that he comes from a broken home, and that he's been working hard and getting treated poorly his whole life. He's never left Alabama and doesn't have any hope or dreams for the future, but jumps at the chance to take what he thinks is a simple, well-paying driving job. It, of course, ends up being much more. 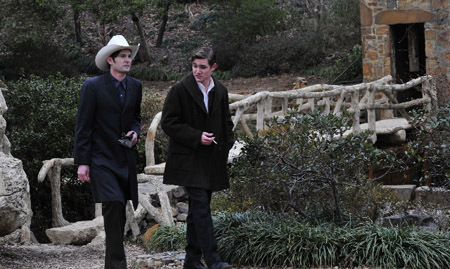 GREG: This film presents a side of Hank Williams that has often been overshadowed by his hit songs. In reality, Williams was a lonely, tormented man with two failed marriages, a bad track record of keeping friends and a penchant for hard living. Did you know these things about Williams prior to working on the film? Do you think this movie will change some perceptions of Williams? JESSE: My dad has always been a big music guy. He's been introducing me to all kinds of music my whole life. So I was definitely already a Hank fan when the project came my way. I do think the film will change some perceptions, particularly in terms of the constant pain Hank was in. He suffered from spina bifida, among other health problems. 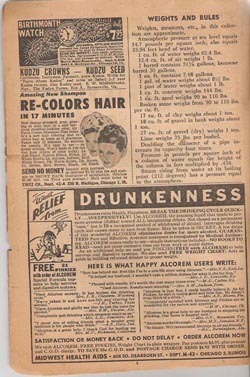 So his debauched lifestyle was really a form of self-medication. I also don't think a lot of people realize that he was only 29-years-old when he passed, which I feel makes his incredible output of classic songs even more impressive. GREG: Perhaps The Last Ride could be summed up as a story about the friendship between a sick man (who knows his days are numbered) and a naive boy on the cusp of becoming a man (who proves to be the kind of loyal friend Williams' self-destructive nature had repelled all along). How would you describe the friendship between Silas and Luke? JESSE: At the start of their trip, Silas and Luke know nothing about each other. Silas has never really had a friend, and Luke admits to "not knowing the first thing about loyalty, 'cause he ain't never seen it." Gradually, as Luke realizes Silas is ignorant of his fame, he warms up. Silas takes care of Luke, who tries to pass on some wisdom before his time is up. GREG: I would assume good chemistry is helpful in the making of a movie, and you and Henry Thomas appear to be a perfect fit. Did everything just come together from the start? JESSE: A lot of times, when making a movie, at some point before shooting begins, the cast and director and whoever will get together and read the script out loud together. It's called a "table read." On this film, Henry and I just got together one afternoon and went over the whole script. That way, by the time we started shooting, we both had a pretty good handle on our characters and their relationship. Also, we shot most of the interior car scenes (which is a good chunk of our dialogue in the film) on one very long day, on a green screen sound stage. This is uncommon and normally would have been very difficult, but we were able to shoot these scenes chronologically. So over the course of the day, the chemistry between Henry and I built and built to the point that, by the end of the day, doing the final emotional scenes came very naturally for both of us. GREG: No story about two buddies would be complete without a little female distraction. Somewhere along the way, Silas encounters Wanda, who is played by the beautiful and talented Kaley Cuoco. Tell us more about their relationship. Silas is hired to drive for a singer he knows only as Luke. JESSE: Kaley did such a great job, and she was so much fun to work with. 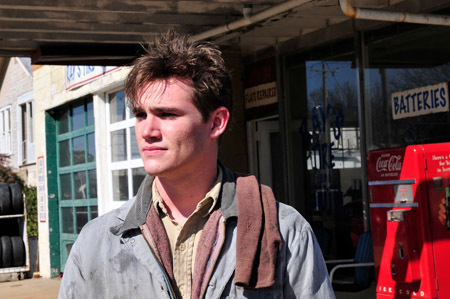 Silas and Wanda cross paths at her filling station, and they have a lot in common. Both have been too busy just surviving and haven't had time or opportunity to look for romance. Just as Silas took a chance on life by taking the driving job, Wanda has to decide whether or not to take a chance with Silas. GREG: It must have been quite a privilege to work with such a great group of talent on this film. Working alongside industry veterans like Fred Thompson, did it prove to be a learning experience? Did anyone in particular help you bring out your best? JESSE: Fred Thompson was fantastic. It was also a privilege to get to work with Ray McKinnon, Stephen Tobolowsky, Jimmy Hampton and Natalie Canerday. I'd been such a fan of their work. And, of course, it was an absolute honor to share the screen with the wonderful Rick Dial in what ended up being his final performance, as he sadly passed away in May. Rick was a hell of a guy -- warm, funny, charming and a world-class actor. I'll miss him. Honestly, I think the person I learned the most from, and continue to, is Henry Thomas. We both started in this business at a very young age, and I've always admired the careers of him and other "child actors" who went on to become successful and respected in their craft as adults. So it was great to get to know him. Now he's like a friend that I look up to and can go to for advice. Kaley and Jesse pose for a photo on the set. Kaley Cuoco stars in CBS's Emmy- and Golden Globe Award-winning series, The Big Bang Theory. She hosted the 2011 Teen Choice Awards, and stars in The Drew Peterson Story, which is expected to release in 2012. In the film, Luke and Silas talk about life and women. In real life, these two hit it off, too. Both were child actors, and Jesse credits Henry as a positive influence on his career. GREG: At the same token, you have quite the résumé yourself, and I'm sure everyone else enjoyed working with you. You've proven to be such a versatile actor. What other projects are you currently working on? What might we expect from Jesse James in the near future? JESSE: I've currently got a few other independent films that have been making the film festival circuit. One of them is Exodus Fall with Rosanna Arquette. And also a movie called Bones with Zakk Wylde. A short film I worked on, October 31: The Bloodnight Chapter, should also hopefully be hitting festivals soon. They all have websites and Facebook pages and such with specific screening info. Other than that, it's just whatever comes my way. I've been writing for a few years, and I'd like to direct something eventually. GREG: What did The Last Ride teach you? Do you think there are any lessons moviegoers can learn from this film? JESSE: Well, I was able to add an Alabamian dialect to my bag of tricks, which is nice. Accents are always handy. It was also useful, it being before my time, to sort of soak up the vibe of the '50s, which the filmmakers tried very hard to replicate and by all accounts succeeded. As far as lessons go, I think the best one in this movie is the importance of owning a radio! The author gratefully acknowledges the assistance of Jesse James' agent, Abby Bluestone, Innovative Artists, Santa Monica, California; Jesse James' manager, Harold Hafner, Dino May Management, Hollywood, California; and Melody Cagle Gaither, Managing Administrative Director, Live Bait Entertainment, Alexandria, Indiana. Author: Greg Freeman. Published October 15, 2011.